And we start out where we do so often talking about your money… and doing more with less. The White House will urge congress to revisit the failed attempt by the so-called Congressional supercommittee to cut the deficit by at least $1.2 trillion, the Associated Press reports. The proposal is somewhat counter-intuitive, coming in an election where where conventional wisdom says you don’t get much done. But it also comes as lawmakers are wrangling with across-the-board spending cuts that are required as a result of the supercommittee’s budget deadlock. Meanwhile Politico notes that the the FAA is headed for another shutdown in 12 days unless Congress steps in. House members and sources indicate House Republicans will back off some of their demands, but that they are likely to ask the Senate for something in return. Congress faces a Jan. 31 deadline. Have you heard of the Blue Button? It is an innovative program created by the Department of Veterans Affairs to give veterans control of their medical records. And it was developed very quickly. Well, the Blue Button is now expanding outside of the VA. The Office of Personnel Management has asked all health insurance carriers in the Federal Employees Health Benefit Program to add the Blue Button to their websites. The Blue Button will allow patients to view and download their personal health data. The program has already been wildly successful in the Department of Veterans Affairs as more than 500,000 veterans have adopted the program in 14 months. Openness and transparency coming to how the U.S. spends its money overseas. The U.S. Agency for International Development is working to make its already-public database of spending data easier to understand. USAID Administrator Raj Shah speaking at the Brookings Institution, says the new Geo-Center project’s online map will help the public evaluate the agency’s programs and provide information that could be used by researchers or other agencies. It’s part of an open-government initiative. Brookings also released findings on transparency among aid organizations. Publish What You Fund ranked the USAID and the State Department in the bottom half of 58 groups. More than eight months after proposing a new website that aimed to make House of Representatives legislation and documents more readily available, the House Administration Committee launched a new website and iPad app to help do just that. The Web site will provide legislative documents in the machine-readable XML format, while the new iPad app, The Congressional Record, will provide improved access to the official Congressional Record. Read more from the Library of Congress blog. And the White House has joined Google+. Jeffrey Zients, the deputy director of the Office of Management and Budget — the chief performance officer — has been named to lead Office of Management and Budget, at least in an acting capacity. The former United States CIO, Vivek Kundra, announced he is joining Salesforce.com as Executive Vice President. And Lt. Gen. Michael Basla will become the Air Force’s chief information officer when Lt. Gen. Bill Lord retires this summer. FedScoop reports that Basla is currently vice commander of the Air Force Space Command at Peterson Air Force Base in Colorado, where he assists the commander in organizing, equipping, training and maintaining mission-ready space and cyberspace forces and capabilities for North American Aerospace Defense Command, U.S. Strategic Command. And, of course, this was the week of the great online SOPA protests — a very online protest of the Stop Online Piracy Act. You probably noticed that many sites went dark. And finally, some carry over news from last week when we told you about the Obama administration’s plan to reorganize agencies specifically around trade. A survey of government executives by Government Executive found that they are wary of the leadership challenges that could accompany the consolidation plan. But Slate.com says the plan is a good idea. They say it would save some money, eliminate some redundancies, and along missions in a more logical way. It won’t balance the budget, but it would save money, Slate argues. The New York Times says that the Obama administration’s campaign to shrink the federal government is a proposal notable less for its goal than for its challenge to a hostile Congress — a very unpopular Congress. One group that isn’t a fan of the changes: Government weather forecasters. Richard Hirn, general counsel and legislative director of the National Weather Service Employees Organization, said the reorg plans go against the original intent of the weather service, which Franklin D. Roosevelt moved from the Agriculture Department to the Commerce Department in recognition of the burgeoning aviation industry and the need to provide accurate, timely weather forecasts. Alan Balutis… he is a Senior Director and Distinguished Fellow for Cisco System’s Business Solutions Group…. 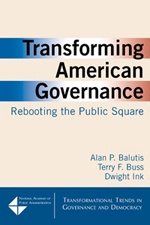 the book is Transforming American Governance: Rebooting the Public Square… You can buy it yourself on Amazon… Google Books has excerpts… and Alan has a blog post about the book… and wrote a piece in the Washington Business Journal headlined, A new wave of federal workers is poised to emerge. And let’s start out with research from one of my favorite people… Bill Eggers and Deloitte’s GovLab… they’ve just put out a study looking at how disruptive innovation can help the government do more for less… and it means actually doing things differently. The key is using disruptive innovation, which can help break the trade-off between price and performance by getting better — and often cheaper — over time. And they say that fostering disruptive innovation requires focus, choosing where to spur innovation. And the report says that the government has an array of tools that can foster the growth of disruptive technologies. 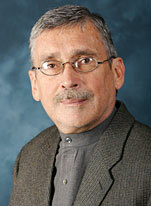 Read his Governing column… or find more about the research itself. With all that disruption, how much change can we actually handle at once? The MIT Sloan Management Review says there people can sustain information overload. Automation trumps hiring. Companies are spending to upgrade factories at a much faster pace than they are hiring. The Wall Street Journal notes that it is an anomaly of this recovery. The story notes one company that is replacing forklifts and their drivers with automated vehicles. He says that as aircraft and weapons have become more precise, human beings have become less essential to the conduct of war. The rise of unmanned aerial vehicles, more commonly known as drones, promises to push human beings further out of the loop. Drones are becoming autonomous, capable of taking off, flying to a target, and returning to base without much human direction. Although military officials insist that the United States will never deploy drones that can select targets and fire weapons on their own, history and the military’s own current research suggest otherwise. What is the role of government CIOs? It’s growing, at least that the findings from a survey by Federal News Radio. It’s growing around mission and budget. Meanwhile, on GovLoop, there are posts about the federal CIOs 2012 plans… an round-up of his speech to AFFIRM… and the video of that discussion… of course, hear the speech about the mobile government plan. And finally… are the people operating the country’s most successful hedge fund getting a government salary? The New York Times says country’s most successful hudge fund is the Federal Reserve. Last year, the central bank turned over $76.9 billion in profit to the federal government, slightly down from $79.3 billion it provided in 2010. The Fed made this money in interest on a nearly $3 trillion portfolio of securities. This enormous holding was built up largely in the wake of the financial crisis as the Fed bought these securities through two rounds of quantitative easing. The Times says the Fed is operating like a hedge fund, leveraging its balance sheet to earn huge profits. The main difference between a hedge fund and the Fed is that the Fed effectively creates its own money, so it doesn’t have any borrowing costs, meaning yet more profits. Remarkably, the Fed’s profits are also an afterthought. One event to mention… Wednesday is the annual Operation Jump Start. If you’ve never been, it is a way to help returning warfighters literally jump start their private sector careers. You can donate suits and all sorts or other things. That that does it for us this week. If you have ideas about stories that are worth a mention… or anything else, it’s GovLoop — we’d love to hear from you. GovLoop has been redesigned. Let us know what you think about that too. And we’re on Twitter, Facebook, Google+, and GovLoop… DorobekINSIDER. Let us know your thoughts.